Sotheby's summer Fine Jewels auction in London on July 13, 2011 featured a major piece: an anemones brooch by René Lalique (1860-1945). Estimated to fetch 10-15,000£ (around $16,000-24,000), it actually sold for 94,850£ -- about $153,000. What made the piece go so high? Exquisite artistry, of course -- but also rarity. Lalique's career as a jewelry designer was relatively brief. In contrast, his glassware is still going strong, a century after his company was founded. 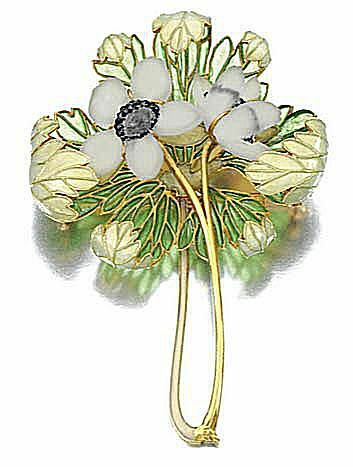 Although best-known today for that frosted glassware, Lalique began as a jeweler, and is considered one of the avatars of Art Nouveau, bringing that turn-of-the-20th-century style to pendants, bracelets, combs and bodice ornaments. Aristocrats and actresses (including Sarah Bernhardt) arrayed themselves in his bits of wearable art. After stints at Cartier and Boucheron, he began designing under his own name (pieces are signed R. Lalique or just Lalique) in 1886, and opened his own shop in 1905 in Paris. Lalique used precious materials like gold and gems - but often combined them with semi-precious materials, such as glass, horn and tortoiseshell. His creations are colorful - a departure from the white-on-white garland style of mainstream jewelry of the period - often soft, glowing colors created by enameling and cabochon cuts. Sometimes these would be combined, as in a female figure with wings. There's often a touch of the fantastical in Lalique pieces. In 1910, the designer purchased a glassworks - and within five years, abandoned fine jewelry in favor of the glass tableware and objets that are still made by his company today. He did continue to design a few mass-produced molded-glass pieces: brightly colored rings, necklaces, cufflinks. But his influence on jewelry style and technique lived on. "His work epitomized the view that value resided in the designer's vision and the craftsman's skill, rather than the size and quality of the gemstones," writes Clare Phillips in Jewelry: From Antiquity to the Present. "Botanical imagery changed radically in his hands from static flower-heads of densely-packed diamonds to flowing fragile confections of enamelled gold, coloured stones, opalescent glass and horn."